The Superdrug near me has had a recent revamp and there have been a few new stalls added, one of them being the I Heart Makeup stand. 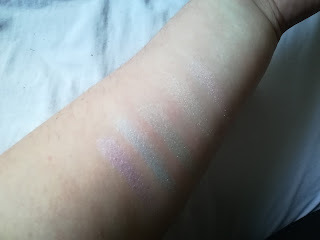 One of my favourite eyeshadow palettes is their Naked Chocolate palette, which I bought online, so I was super happy when I found a physical stand of theirs. This highlighter caught my eye immediately! 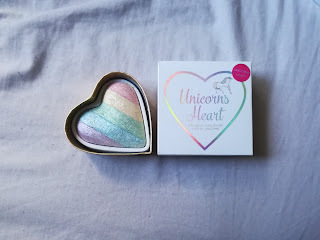 It was a rainbow highlighter in a heart shaped box and I just could not help staring at it! I tried it in store on my hands and I have to say, the pigmentation was amazing! 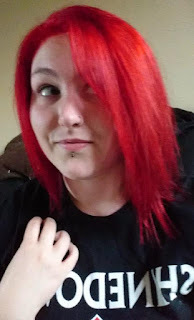 I couldn't help it, I had to pick it up! I was so excited and I opened it when home. The box is really cute but I found that mine wasn't really secured enough, the pan wobbled around in the box and it doesn't go right to the edges, so some product might get wasted with kickback. Since I don't use highlight I didn't actually have a brush, but I used my fan nail art brush and I have to say it works pretty well! The rainbow aspect of it doesn't really do much to be honest, when you swipe the highlighter with a brush and apply it to the cheeks it just gives a pretty glow and the colours don't really show up. I think this might be a bonus though because I think a blue or green highlight would be slightly out of my comfort zone! The finish it gives is beautiful, it has micro glitter in it and catches the light in such a lovely way. I was expecting this to make me look a little sweaty but it honestly does just give me a lovely sheen. I tend to just apply this to my cheek bones and sometimes on my cupid's bow, since I'm still trying to get the hang of it. It does create quite a bit of kickback, meaning you do have to be careful when applying it. Although it is quite powdery, it doesn't feel chalky and it's smooth to apply. To say that this is only £4 I'm really happy with the quality! There is a decent amount of product here and even though I've started to highlight more since buying this, I don't think I will need another one for quite a while yet! Have you tried this highlighter? What did you think? What is your favourite highlighter? Let me know!